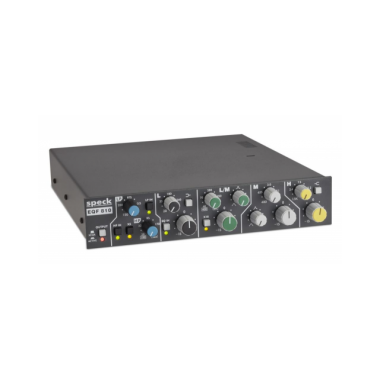 The EQF 810 is a professional single channel analog parametric equalizer and variable filters in a 1/2 rack format. It is simple...it is useful...and it delivers the high quality and specifications found in all Speck Electronics gear. 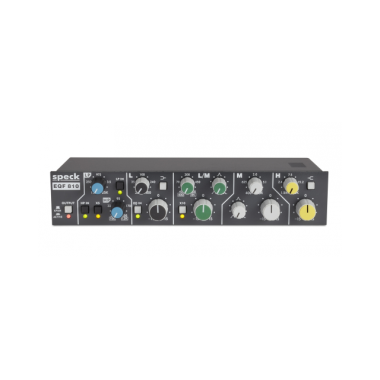 This compact 4-band parametric equalizer has 12 controls for equalization adjustment that covers the audio spectrum from a low 20Hz all the way up to 25kHz. To enhance the classic EQ experience, the front panel includes a switch that will select either a "Jensen Transformer-Balanced" or "Active-Balanced" output. Low Band - a low band that sweeps the low frequencies from 20Hz - 400Hz. This band offers a Peak/Shelf select switch. Low/Mid Band - a switchable low and mid band. This fully parametric section can be switched between a low frequency band that sweeps from 40Hz - 800Hz, or a mid frequency band that sweeps 400Hz - 8kHz. This band has a variable bandwidth adjustment. Mid Band - a fully parametric mid band with a frequency sweep range from 400Hz to 10kHz. High Band - a high band that adjusts the high frequency from 1.5kHz all the way up to 25kHz. This band also offers a Peak/Shelf select switch. Low Pass - A variable 12dB/Octave filter with Bypass switch is adjustable from 150Hz to 25kHz. High Pass - A variable 12dB/Octave filter with Bypass switch is adjustable from 20Hz to 250Hz. The 5X switch will change the adjustable range from 100Hz to 1.2kHz. Connect the EQF 810 to virtually any line level source: balanced, unbalanced, or mixer inserts. The EQF 810 has high headroom that will handle balanced signals up to +28dBu. 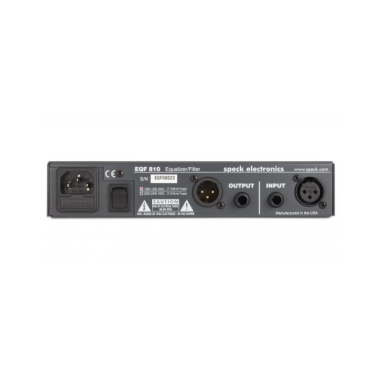 Both balanced XLR and balanced 1/4" jacks are provided for signal connections to and from the EQF 810.THD+N: 0.0014% @ +24 dBu. Dimensions: WxHxD=8.6" x 1.75" x 11"